An anthropologist revisits his Armenian Peace Corps village. “The toughest job you’ll ever love”: when I first encountered this Peace Corps motto as a child in the 1970s, I could not have known that I would join Peace Corps in Armenia, or that the country’s people would make such an impression that I would return there twenty-five years later. 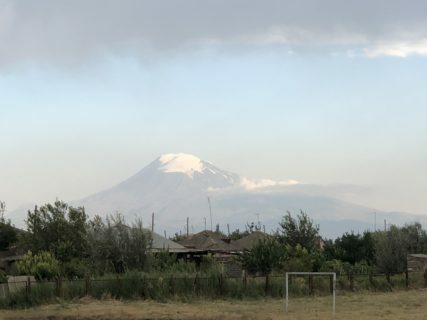 Going back to Armenia recently has led me to reflect on my experiences, on the value of Peace Corps, and on anthropological goals. As a Peace Corps Volunteer, I was not a naïve do-gooder, although I bought in to the ideal of helping others, and, as a budding anthropologist, I was drawn to the adventure and cross-cultural experience. Our group of volunteers, known as Armenia-1, was the first Peace Corps cohort in that nation, newly independent from the Soviet Union and at war with Azerbaijan. Assigned to be an English teacher in a village school, I had no illusions about the impact I would have on my community. I occasionally felt jealous of volunteers in other countries, where they planted trees or built bridges. That seemed more like concrete “development.” Even the villagers asked why I came to Armenia to teach English when the nation was struggling to find food and generate electricity. Wartime deprivation had left the shops empty, and the 1988 earthquake had caused the nuclear power plant to shut down. Azerbaijan regularly blew up the natural gas pipeline that supplied Armenia’s other power stations, so the country often lacked basic utilities. Armenians lamented the situation, stating: “Gaz chka, joor chka, luis chka” (No gas, no water, no light). People cut down trees in city parks for heating fuel, and my host family in the capital Yerevan carved a hole in their apartment for the exhaust pipe from a wood stove. I cringed as they went through their bookcase deciding which of their books to burn for fuel. In the course of this inventory, my host, Armen, discovered a Soviet book about Peace Corps volunteers. He read about the seemingly friendly American volunteer who is a CIA spy. Laughing, Armen pointed out that I had mysteriously learned Armenian in three months and that the book seemed to be describing me perfectly. He did not believe the Soviet propaganda, but like many Armenians, he wondered about the Peace Corps mission. I shared his concerns because I did not expect that being an English teacher would allow me to change lives or save the world one verb at a time. When I arrived in the village, the local English teacher, Felix, took me around the school to meet the children. I wanted to establish my authority by having students address me in the standard fashion, as Nker (Comrade) Falen. However, before I could say anything, Felix had introduced me as “Mister Doug,” and this became my name thereafter. I soon dispensed with the Soviet textbooks that criticized the dangers of capitalism and praised the “famous” communist artists in America. Instead, I devised conversational scenarios and taught songs. I grew close to two families, spending much of my time eating and farming with them. When I left the country, I said tearful goodbyes to my hosts, my fellow volunteers, and Armenia, not knowing if I would ever see them again. After this powerful experience, made more intense by the wartime conditions, I was inspired to pursue a career in anthropology. Although I chose to study West Africa, anthropology was my attempt to continue what I had started in Armenia – a personal journey into another culture. 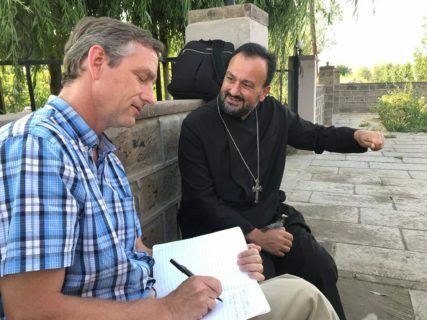 In 2018, I returned to Armenia to conduct fieldwork on religious movements. Felix’s family treated me as a long-lost son, but what surprised me most was how many former students remembered me. As I walked around the village, people would approach and say, “Hello Mister Doug! You haven’t changed!” At a church service, the pastor announced my presence to the congregation and asked, “Who remembers Mister Doug?” To my amazement, nearly one hundred hands went up. The author interviews a local priest. Karen Gabrielyan. People remembered me because I was the first American they had ever met or will ever know. I did not see any lasting signs of my presence like there would be if I had built a bridge. The things that people remembered had more to do with my personality and behavior than with my English lessons. One former student told me he remembered vividly the day during class when I was sitting in a chair talking to the students. He said that I stood up and stepped backwards, swinging my leg over the chair. The others in the room chimed in, “I remember that!” On another occasion, a man said that his strongest memory of me was learning the way I twirled my pencil in my hand. From Felix, the stories were more intimate—shared jokes, memories of working on the farm together, and gifts we exchanged. 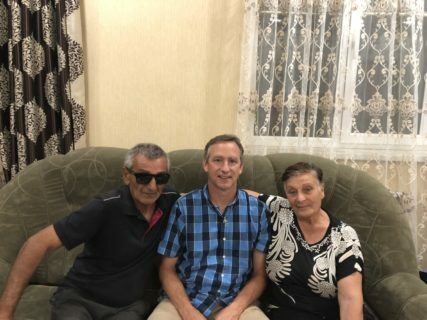 After hearing these stories, I have concluded that, for many volunteers like me, the impact of Peace Corps is more about human interaction than “development.” Armenia has developed—the nuclear plant is online, and foreign investment has brought hotels and restaurants to Yerevan. In my village, many people own cars, and their homes have updated kitchens and Wi-Fi, but these changes had nothing to do with me. Still, I do not regard Peace Corps as a useless enterprise; on the contrary, its value is consistent with the anthropological objectives of breaking down cultural barriers and creating goodwill between peoples. Peace Corps offers opportunities to expose Americans to cultural others, and in the process, foreigners come to know an American, not as a technocrat bringing “development,” but as a fellow human being. Douglas J. Falen is professor of anthropology at Agnes Scott College in Decatur, GA. His latest book reflects on the way personal relationships shaped his interpretation of magic, religion, and science.